Well, a little over week ago, me and a buddy of mine were pulling into the festival grounds in Summerset Wisconsin for a 3 day music festival that promised to rock our socks off. I was incredibly excited for the line-up they had in store and to just be able to hang with a few friends in the sun. After some jumping through hoops, we had media credentials in hand (OK, they were wristbands actually, but you know what I mean) and we were headed off to the sea of tents to stake our claim on a spot. Yelawolf looked to be enjoying himself as he got his show started. We spent the next few hours running all over the festival grounds, trying not to miss a minute of the action. Over to the Hockey Arena to catch a few minutes of Bassjackers, back to the main stage to see some Cloud Cult, run over to the Second stage for a little PROF then set up shop back at the main stage for Big Gigantic to close out the evening. They were the reason I wanted to come to the festival in the first place and I wasn't going to miss a minute. For those of you not familiar with Big Gigantic, let me take a minute to enlighten you. A blend of electronic, jazz and jam band, they are a quintesential festival show. With Dominic Lalli adding vocals and saxophone and Jeremy Salken on the drums, they drop some of the most inventive tracks around. 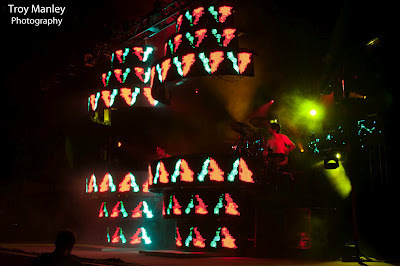 Now throw in a ridiculous light show and sound pounding so hard your eyes rattle in your skull and you have all the ingredients for an epic show... and that is exactly what we got. How did you get the name/ where did it come from? What continually inspires you to push the limits of performing arts. With the live saxophone and the drums and DJing at the same time. What would we find you listening to right now? 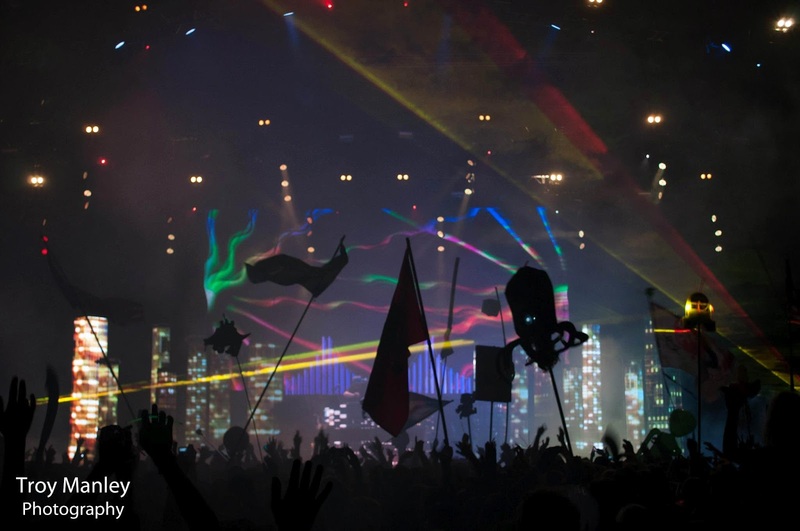 What brings the music and festival scene together, what is your favorite part, what is the most essential part? What is changing the face of music? “The fans are just as important as a music, but definitely the audio visual experience. When the lights are coupled with the music.” It’s definitely a big part of the movement. “Some of it takes on traits of older stuff like Pink Floyd and The Wall. That was it, but the visual stuff definitely wasn’t what it is now. Light production, and definitely the computer. That is obviously huge in this movement. Everyone can make music. You can listen to it that day. You don’t have to make a record and wait. The music can catch on super quickly. Everything moves quick on the internet." Saturday brought another full day of music. By the time I rolled my sorry backside out of my tent, got some food in me, and sat out the passing rain storm, I could hear music from the main stage. From early in the day, great music options were plentiful. Tea Leaf Green, Solid Gold, Excision, NAS, and Matt and Kim all filled slots on the main stage, with Umphrey's McGee killing the final set. This was my first Umphrey's show (I know, ridiculous right?) and man, they were something else all together. It was a conglomeration of all my favorite genres at one time. Love me some electric guitar and pounding bass, and they are masters at both. 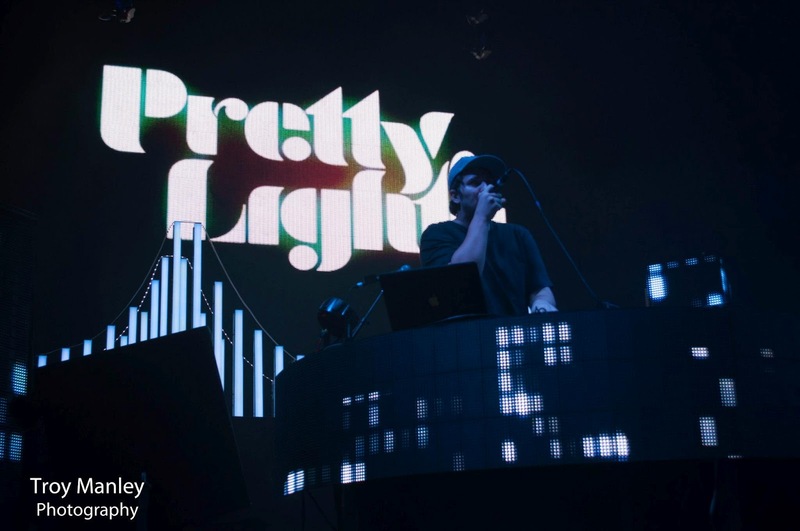 Umphrey's McGee lighting up western Wisconsin. What are you guys trying to do with your music in the next couple years? 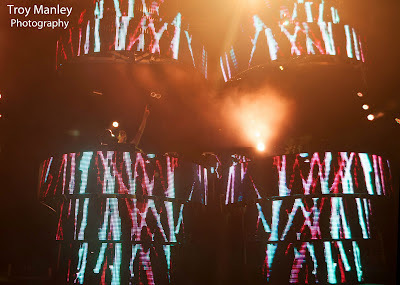 The cool thing about electronic music is the shows are like performances. Right now we’re outside this hockey rink for summer set and you can see Infected Mushrooms stage set up. Which is inspiring to us, we’re trying build things with our eye and trying to docool things with our music and our show. It’s no longer that you can get up there with dj’s and a mixer and rock the show. It’s now become a live performance. What got you into wanting to perform. Justice is what really got me into all this. They really grabbed the audience. What would we find you listening to right now? What to look out for? Just streaming other peoples mixtapes and getting inspiration from their mixtapes and finding new tracks. I love BBC Radio 1, you can put it on and let it go forever because it’s all quality. The music we tend to like and perform is darker heavier electro dubstep. I’ve been listening to some of this jammier stuff, like gramatik, and I’ve been digging it. It’s new to me, different to me, but I’ve been checking it out and digging it. Unfortuately, part of our crew had to skip out on the Sunday action. 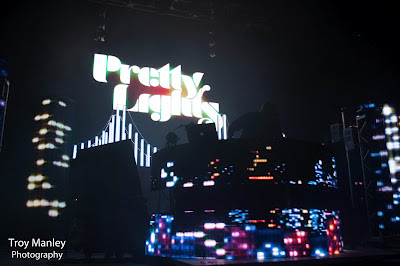 Trust me, none of us wanted to leave, especially with Pretty Lights closing out the show. Sunday's line-up was sick too... Lotus, Black Star, Infected Mushroom, Big Wu, and DJ Abilities were all playing at one time or another. Even casual electronic music fans know Pretty Lights. With a blend of hip hop beats and funky soul, Derek Smith creates more than just music, he builds a mood. He is like a musical puppet master, making 15,000 people dance with a little twist of his wrist.